There will be many who will be hoping to see rapid developments in the EOS M line including new models that fill in the gaps - particularly the ones where faster AF, a viewfinder, physical controls and greater customisation fit. As it stands, though, there will be no shortage of Canon compact upgraders who see the EOS M as the logical path to more sophisticated photography as well as DSLR owners keen to try out their EF and EF-S lenses on a compact body. 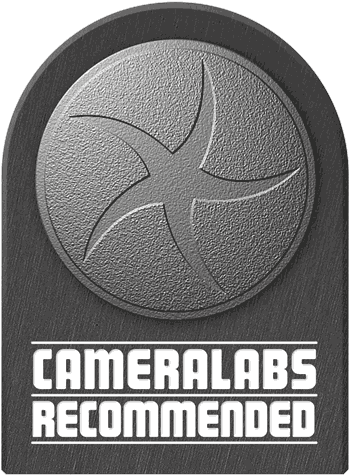 The slow AF even with native lenses, lack of viewfinder options and limited native lens catalogue at the time of writing rule out our top rating, but it remains a solid beginning to Canon's mirror-less compact system camera line and one deserving of the Cameralabs Recommended Award. Just be sure to compare closely with the competition, especially if you want a viewfinder, quicker AF or access right now to a broader native lens catalogue. The EOS M is Canon’s long-awaited entry into the mirror-less compact system camera market. Announced in July 2012 it employs an 18 Megapixel APS-C sensor and a new EF-M lens mount with a 1.6x field-reduction factor. Canon launched the format with two native M-mount lenses, a 22mm f2 pancake prime (35mm equivalent) and an 18-55mm f3.5-5.6 stabilized zoom (29-88mm equivalent), both of which feature STM stepper motors for quick and quiet movie AF. Meanwhile, the entire Canon EF and EF-S lens catalogue is supported with autofocus and auto exposure using the optional EF-EOS M adapter. Much of the EOS M’s technology has already been seen before in the EOS T4i / 650D. Both cameras share the same 18 Megapixel CMOS sensor with hybrid AF which dedicates pixels on the main sensor to perform phase-detect AF during video and live view, backed-up by contrast-based AF for fine-tuning. Both cameras also share essentially the same 3in touchscreen interface, although with a minimum of physical controls on the EOS M, the screen becomes the primary means to operate the camera. 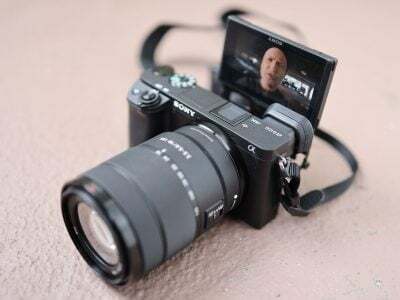 Note the screen is not articulated on the EOS M and there’s no built-in electronic viewfinder, nor means to connect one as an accessory. There’s no built-in flash either, although the hotshoe is compatible with Speedlites and Canon additionally offers the new Speedlite 90EX mini flash unit which is bundled with the camera in some regions. The movie functionality is also pretty much inherited from the EOS T4i / 650D with a choice of frame rates (1080p at 24, 25 and 30fps or 720p at 50 and 60fps), continuous AF with the hybrid AF system, full manual exposure control, built-in stereo mics, adjustable audio levels and impressively for a compact system camera, an external microphone input. Completing the headline specifications are 4.3fps continuous shooting, a 31-point AF system, support for UHS-1 SD cards, and a selection of composite shooting modes including HDR and four-frame multi-shot noise reduction option. Having arrived late to the party, Canon faces competition from manufacturers who have had the time to develop mature CSC product ranges with the foundations of a comprehensive library of native mount lenses in addition to other accessories. The current line-up of mirrorless models from Sony, Olympus, Panasonic and Nikon also, to a greater or lesser degree, include models suited to a range of users from compact upgraders to enthusiasts. So where does the EOS M fit in the mirrorless compact system camera market, who will it appeal to and how does it compare to similarly priced models from other manufacturers? To answer those and other questions, I’ve compared the Canon EOS M to the new PEN E-PL5 from Olympus. A third-generation mirror-less CSC from a manufacturer with a history of popular models with innovative features, the Micro Four Thirds PEN E-PL5 is in the middle of the PEN range and, with an expanding range of native lenses, built-in stabilisation, an articualted LCD screen, optional viewfinder and the same sensor as the highly rated OM-D E-M5, provides a perfect example of the kind of competition the EOS M is up against. Read my full review to find out how it measures up! Canon’s first mirror-less interchangeable lens digital camera may carry the EOS brand, but in styling and controls it’s very much aligned towards the company’s ELPH / IXUS range of point-and-shoot models. I assume the EOS M is the first of a new family of cameras and that a more sophisticated model may be targeted at enthusiasts at a later date, but right now it’s clear Canon is aiming this first model at those upgrading from a point-and-shoot or looking for a simple complement to an existing DSLR. Indeed it’s revealing to compare the EOS M against the PowerShot G1 X and G15 as these fixed lens cameras are considerably more sophisticated in terms of physical controls and external appearance. Physically the EOS M shares similar vital statistics to its nearest rivals. The EOS M body measures 109x67x33mm and weighs 298g with battery but no lens. In comparison Sony’s NEX-5N (which also shares an APS-C sensor) measures 111x59x38mm and weighs 269g with battery, making it shorter but a tad thicker. Panasonic’s GX1 measures 116x68x39mm and weighs 318g including battery, making it a little wider and thicker. The Olympus E-PL5 measures 111x64x39mm and weighs 325g including battery, and is the only one of the group to include built-in stabilization. Just for the record, Sony’s Cyber-shot RX100 measures 102x58x36mm and weighs 240g with battery, making it smaller and a little lighter overall, and impressively that includes its built-in 3.6x optical zoom that’s equivalent to 29-105mm. For completeness I’ll finally add that Canon’s own PowerShot G1 X measures 117x81x65mm and weighs 534g with battery, making it noticeably chunkier and heavier than all the models above even with its smaller sensor, although it includes a 4x / 28-112mm equivalent optical zoom. While Sony’s RX100 is undoubtedly a miracle of miniaturization, the figures above should tell you the EOS M is roughly the same size and weight as its interchangeable lens peer group when comparing bodies alone. But of course a camera without a lens only tells half the story and bigger differences emerge when you mount your optics. Canon launched the EOS M with just two native lenses, a 22mm f2.0 pancake (61x24mm, 105g, 15cm closest focusing, non-stabilized) and an 18-55mm f3.5-5.6 IS zoom (61x61mm, 210g, 25cm closest focusing distance). So fit the pancake and the EOS M becomes 57mm thick and 403g, and fit the zoom and it’ll become 94mm thick and 508g. Sticking with kit zooms, Sony’s 18-55mm E-mount is similar in size and weight to the Canon, bringing the NEX-5N thickness to 98mm and its overall weight to 463g. 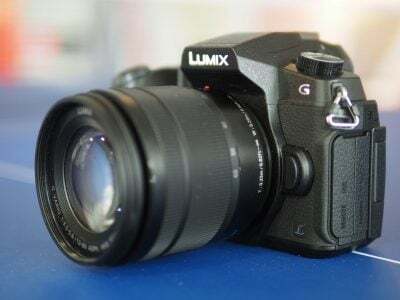 Panasonic’s basic 14-42mm is also roughly the same size, bringing the GX1’s thickness to 103mm and the weight to 483g. Meanwhile Olympus supplies a collapsing 14-42mm lens which in its smallest configuration brings the E-PL5’s thickness to 89mm and its overall weight to 438g. So far so similar, but Panasonic and Sony now have trump cards to play with their respective Power Zoom lenses which not only offer motorised zooming, but also collapse into very compact form factors. Panasonic’s 14-42mm Power Zoom lens folds down to just 27mm thick (and also works on Olympus bodies), while Sony’s 16-50mm foldes down to 30mm. So while most of the mirror-less interchangeable lens cameras mentioned above are very roughly similar in size when fitted with their standard kit zooms, the Micro Four Third sand Sony NEX models enjoy an overall size and weight advantage with their collapsing Power Zoom options. So as it stands, the EOS M is only really pocketable when fitted with the unstabilized 22mm f2.0 pancake prime. Fit any zoom on it, native or otherwise, and it’ll become considerably bigger. To be fair, it won’t become anywhere near as big as a traditional DSLR and it’s certainly no bigger than a standard Sony NEX kit, but again the EOS M with the 18-55mm is not as pocketable as a Micro Four Thirds body when fitted with the Panasonic Power Zoom, or a NEX fitted with Sony’s Power Zoom. Canon really needs to develop a collapsing kit zoom as soon as possible to compete in this regard. After that detailed discussion of sizes and weights, it’s actually pretty simple to describe the design and controls of the EOS M. As I said at the top, the style and controls are closer to an ELPH / IXUS point-and-shoot than an EOS DSLR, or indeed a higher-end PowerShot from the G, S or SX series. 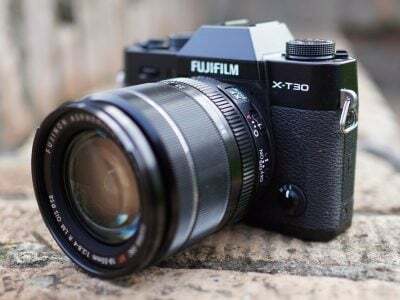 Much to the upset of many enthusiasts, there’s no dedicated mode dial, just a three-way rotary switch around the shutter release to select between full Auto Stills, Creative Stills and Movies. Don’t worry, there’s still the chance to choose PASM modes, but you’ll be doing so via the on-screen menu system, just like Sony’s NEX system. Round the back, you’ll find the usual four-way rocker with a rotary dial and direct access to the drive mode, exposure compensation, exposure lock and a re-configurable delete button, the closest you’ll get to a Function key on the EOS M. This is surrounded by dedicated buttons for accessing the Menu, Info views and Playback along with one to start and stop video recording, but only when the mode dial is in the movie recording position. All other functions are accessed via the touch-screen menu system, although in a departure from the external styling, the menus are essentially lifted from the EOS T4i / 650D, so will satisfy enthusiasts in their detail and scope. The simple external controls and advanced on-screen menus may seem like a contradiction, but they actually work well together and allow the EOS M to be accessible by beginners but still appreciated by enthusiasts. It’s a similar approach taken by Sony with its NEX system, although personally speaking I find the Canon EOS M menu layout and controls easier to navigate than Sony’s. If you’re a die-hard dial-turner though, you’ll ultimately prefer the physical controls of the comparably-priced Panasonic and Olympus system cameras, or indeed Canon’s own PowerShot G1 X. By comparison, the Olympus E-PL5 sports a dedicated mode dial but also has a programmable function button as well as permitting much greater customisation of all its other physical controls from the control wheel to the dedicated movie record button. In terms of connectivity, the EOS M is fitted with the expected USB / AV and Mini HDMI ports, but in a very welcome surprise there’s also a 3.5 mm microphone jack which gives it an edge over rival models. In the top right corner of the front panel you’ll find an AF illuminator and IR sensor for use with optional Canon RC remote controls. The EOS M can’t be controlled remotely using the EOS Utility application, which will come as a big disappointment to those who were hoping to be able to take advantages of the application’s interval features for time-lapse photography. When you connect the EOS M to a computer running the EOS Utility, the Remote shooting menu disappears. On the top of the camera you’ll find stereo microphones and a proper hotshoe which is fully compatible with all Canon Speedlites. Canon’s also developed the EX90, for the EOS M, a mini flashgun with a Guide Number of 9 at 100 ISO. The presence of a standard hotshoe is very welcome, but what you won’t find on the EOS M is a built-in flash. In this respect it takes a similar approach to the Olympus Pen E-PL5. You’ll also notice there’s no electronic viewfinder built-in, nor any means to connect one as an accessory unless Canon has some neat tricks planned for the hotshoe. In this respect it falls behind comparably priced models from Sony, Panasonic and Olympus, all of which offer EVF accessories. The EOS M has a new LP-E12 battery that provides enough power for 230 shots. That’s a miserly performance which doesn’t compare favourably with other cameras in this class. The Sony NEX 5N manages to squeeze an impressive 410 shots from its battery and with the PEN E-PL5 you’ll get 360. Canon’s fixed lens G1X does marginally better with 250 shots, but if you exclusively use its optical viewfinder that increases to a generous 700 shots. The EOS M provides a 4-segment battery life display which flashes red when the power is about to run out – an all too often occurence diring the time I was using it. The EOS-M doesn’t include a built-in flash, but in many regions the kit includes the new Canon Speedlite 90EX. The 90EX can be used on any Canon body with a hotshoe (including the DSLR range), but it’s clearly been designed to complement the EOS M. When fitted to the camera, the upward sloping body raises the flash head well above the lens mount – a much greater extension than would be possible with a pop-up flash – helping avoid red-eye and shadows from longer lenses. Personally, I think a flash attachment is a much better option on a compact system camera – even one aimed at compact upgraders – than a built-in unit. Apart from the advantages I’ve already mentioned, a separate unit can be left at home if you don’t plan on using it, or carried in your pocket. This is a philosophy that’s shared by both Olympus and Sony, though the latter’s screw in flash attachments can be a bit fiddly. Physically, the Speedlite 90EX is much larger than the flash supplied with the Olympus PEN models, one reason being that it is powered not by the camera (something of a relief, given its feeble battery life) but by a pair of AAA batteries. The Guide number is 9 at 100 ISO making it more powerful than the PEN E-PL5’s add on flash which has a guide number of 10 at 200 ISO. In practice, that means that you’ll get roughly the same maximum range from the flash on the EOS M at 100 ISO as you will on the PEN E-PL5 at its base 200 ISO sensitivity setting. With the Speedlite 90EX attached, and turned on via the small button at the rear, the Flash can be controlled in the same way as other external flashes via the External Speedlite Control menu item. This allows you to set, ETTL or manual flash metering, select wireless control of other external flash units, choose 1st or 2nd curtain synchronisation and set flash exposure compensation. The lack of an electronic viewfinder on the EOS-M, whether built-in or as an optional accessory, is one of the biggest disappointments and, without a doubt, one of the biggest downsides to the EOS M. While it won’t bother anyone who’s become used to screen-based shooting on a compact, it will infuriate enthusiasts – not to mention spectacle wearers – who prefer the option of eye-level composition. Despite a price tag at the higher-end of the system camera market, its absence is the clearest message that Canon’s mirrorless debut is aimed at compact upgraders and we can only hope that they’re planning models that will incorporate a viewfinder or the ability to add one. In the meantime, the 3in Clearview LCD touch-screen is the exclusive means by which you compose and playback shots and in terms of its performance it matches the high standards set by Canon with its compact touch-screen models and more recently the EOS T4i / 650D. The 1040k dot screen is 3:2 proportioned, so the image fills it completely with information and touch icons overlayed – the only time you ever see black bars is when you switch to a 16:9 movie mode. The screen is bright and contrasty and easy to see in most situations with the obvious exception of bright sunlight. The fact that it’s a fixed screen will doubtless disappoint the same people who’ll bemoan the lack of a viewfinder. Certainly, compared with the PEN E-PL5, which offers a flip-up-and-over screen as well as a very good optional electronic viewfinder, the EOS M seems poorly equipped. It’s only fair to point out that the entry level Pen Mini E-PM2 also has a fixed screen, but that, like all the PEN models, still has the electronic viewfinder option. Canon clearly has some catching up to do here. One final point worth making is that the EOS M’s 3:2 screen provides a much larger viewing area than the PEN E-PL5’s 3 inch 460k dot screen which is 16:9 proportioned. The E-PL5’s 4:3 images leave wide black bars down either side, though it is ideally suited to shooting video. The angle of view on the EOS M screen is quoted as 170 degrees, which sounds wide and in practice it is. Normally when you reach acute viewing angles screen illumination drops off fairly rapidly, but, indoors at least, I found I was able to see the EOS M’s screen right up until it was actually no longer physically visible – you can’t ask for more than that. Being a touch screen, it is also of course used to operate the camera, providing menu selection, image playback and touch-focus, as well as other functions. The EOS M introduces the new EF-M mount for lenses. It’s designed for the short flange-to-sensor distance of a mirror-less body, although thanks to the APS-C sensor, the field-reduction factor remains the same as EOS DSLRs sharing the same sensor dimensions. As such any lens you mount on the EOS M effectively has its focal length multiplied by 1.6x, and like Canon’s DSLRs, any stabilization has to be built-into the lens. Canon chose to launch the EOS M system with just two native EF-M lenses: a 22mm f2 unstabilized pancake prime (35mm equivalent with a 15cm closest focusing distance) and an 18-55mm f3.5-5.6 stabilized zoom (29-88mm equivalent with a 25cm closest focusing distance). Both lenses sport Canon’s latest STM stepper motors for quick and quiet movie AF. So at launch there’s no telephoto zoom, no portrait lens, no macro, no ultra-wide, and no super-zoom in the native EF-M mount. Indeed just two native lenses makes the EOS M the most basic system on the market, although its killer selling point is the ability to use any lens in the extensive EF and EF-S lens catalogues with the EF-EOS M adapter. Of course one of the benefits of any mirror-less camera with a short flange-to-sensor distance is the ability to exploit almost any lens with an adapter, and indeed there are Canon EF adapters for most rival system cameras. But what makes the EOS M different from the rest is it’s the only one to support auto exposure, electronic aperture control and crucially, autofocus with EF lenses. So suddenly a camera which only has two native lenses becomes one with access to over 60. Better still, the adapter is reasonably priced and cheaper than the comparable adapters for the Nikon 1 and Sony NEX systems. There are however several big caveats involving autofocus. The first, as I’ll explain in more detail later, is that the EOS M is not the world’s fastest autofocuser, and this actually becomes slightly worse with EF lenses, even those with USM. Secondly the EOS M will only support continuous autofocusing with EF-M lenses. With EF lenses, you’re limited to single AF, although in testing I found I could touch-focus and also track moving subjects during video, and I have some examples later in the review. The problem comes during continuous shooting: you can select Servo AF, but with an EF lens fitted the focus is locked on the first frame. I should also add EF lenses, even USM models, are much more audible when focusing during movies than the native EF-M STM models, so you’ll definitely want to use an external microphone or dub over video afterwards. With all that said, the EOS-M fitted with EF lenses should be just fine for landscape, macro and tripod-based shooters, but portrait, street or action photographers will find it too slow and the lack of continuous AF an issue. That said, the fact it’ll even autofocus at all with EF lenses is a huge advantage for the EOS M and a reason many will buy it over rival models. Canon understands this perfectly well, but equally I hope it releases a roadmap of native EF-M lenses sooner rather than later. I should also note that the lack of continuous AF on non-native lenses isn’t a restriction limited to the EOS M: many other compact system cameras suffer from similar restrictions. The 18-55mm f3.5-5.6 zoom is, as I mentioned earlier, similar in size and weight to the Sony E-mount 18-55mm. It’s solidly constructed with a wide zoom ring with focal length markings and a Leica-style diamond knurled section for improved grip. The zoom action is very smooth, making it possible to achieve reasonably good results even during video recording. The manual focus ring at the front also has a very smooth action. The EF-M 18-55mm is a stabilised lens and when it’s fitted to the EOS M body stabilisation can be activated from the menu. There are just two options, enabled and disabled, sharing more in common with Canon DSLRs than the Intelligent IS system offered on high end Canon Compacts. The lens does, however, provide Dynamic IS in movie modes which counteracts rolling motion and is designed to smooth out the kind of camera movement that occurs when filming while walking. To test the effectiveness of the stabilisation with the EF-M 18-55mm on the EOS M, I zoomed the lens to its maximum 55mm (88mm equivalent) focal length and took a series of hand-held shots in Shutter priority mode at progressively slower speeds with the stabilisation enabled and disabled. You can see the results in the 100 percent crops below. Canon’s claims for 4 stops of image stabilisation are born out, with the EOS M with EF-M 18-55mm just capable of producing a sharp image at 1/5th. It took a couple of attempts to get this shot, which isn’t 100 percent sharp, another argument for a viewfinder which would help ensure stability with the camera pressed to your face. Having said that, the EOS M with the 18-55mm zoom is a comfortable camera to hold and feels quite stable. 100% crop, 18-55mm at 55mm 100 ISO 1/5th IS Off. 100% crop, 18-55mm at 55mm 100 ISO 1/5th IS On. The Canon EOS M features a simple mode dial on a collar surrounding the shutter release (where the zoom collar would be on a compact) with just three positions for fully automatic (Scene Intelligent Auto) stills, creative stills and the movie mode. Set to the fully automatic mode, the EOS M will take care of everything for you, but turn the dial to the middle creative position and you’ll be able to choose from a wide selection of scene presets and traditional PASM modes via the touch-screen. Scene Intelligent Auto uses Scene detection popular in Canon’s compact range to determine the best exposure. Switch the mode dial to the middle position and you find yourself in Creative Auto mode for accessible control over depth of field, white balance, exposure compensation and other settings. With the dial in this position you can also select any one of seven scene modes by tapping the mode icon to access a menu. The last two of these are composite modes; Handheld NightScene takes four shots at a preset ISO sensitivity and combines them for a low-noise result, HDR Backlight Control is new and takes three consecutive shots which in combination produce a result with extended dynamic range. This mostly works to retain highlight detail as shown in the example below. HDR Backlight Control sets the ISO sensitivity automatically. For the example below the metering selected 6400 ISO, the shot shown alongside on the left was taken in Aperture priority mode at 6400 ISO. Though in this low light high ISO shot there’s little blown highlight detail to be recovered in the HDR Backlight version you can see from the crop that much more tonal detail has been recorded in the shadows. On the same menu you’ll find Program, Aperture and Shutter Priority and full Manual modes, with shutter speeds from 1/4000 to 30 seconds plus a Bulb option. No figures are quoted for the maximum Bulb exposure time, which varies depending on the shooting mode but in Manual mode I managed Bulb exposures in excess of ten minutes. The elapsed time is helpfully indicated on the screen during bulb exposures so you don’t need a separate timer. The EOS M also includes Creative filters which can be applied in most modes and also used for movie shooting. These filters are popular on Canon compacts though the range varies from model to model. The EOS M includes Grainy BW, Soft Focus, Fish-eye, Art bold, Water painting, Toy camera and Miniature effects. Here’s some examples of the filters in action; it’s possible to vary the strength or style of most effects using a touch icon to select from one of three settings, for example to alter the contrast of the Grainy BW effect. The fastest flash sync speed is 1/200. There’s basic exposure compensation in a range of +/-2EV and equally basic three frame bracketing available. Unlike the Nikon 1 there’s no built-in intervalometer nor time-lapse features, and, disappointingly, the EOS M can’t be controlled using the the EOS Utility, so it isn’t possible to remote control it and enjoy deeper bracketing over USB via a computer or a sophisticated USB cable release. Like many mirror-less system cameras, the EOS M employs an electronic first-curtain for quick response and a mechanical second curtain for exposures. DSLR owners may be alarmed to find the sensor exposed to the elements, but again this is in line with other mirror-less system cameras and dust is rarely an issue for them. The EOS M essentially inherits the movie capabilities of the EOS T4i / 650D. Set to PAL they are 1080p25, 1080p24 720p50 and 640p25. Switch to NTSC and the 25 and 50fps modes are substituted for 30 and 60fps modes. As before, video is encoded using H.264 with uncompressed PCM audio and stored in a QuickTime MOV wrapper and you’ll need a Class 6 (or higher) SD card to support the maximum recording times. The maximum single clip recording time is 29 minutes and 59 seconds. There’s also a single file size limit of 4GB. You’re looking at about 330MB per minute in any of the HD movie modes, with the 720 option consuming the same as the 1080 due to its higher frame rates. So that 4GB file limit will actually be reached after approximately 12 minutes, regardless of the HD quality setting. When this happens, a new file is automatically created without interruption to the recording. There’s full manual control over exposures and, thanks to the hybrid AF system, the chance to continuously autofocus while filming. In practice this is organised by offering a mode menu with two options – Movie manual exposure and Movie auto exposure. Continuous or ‘Servo AF’ is automatically activated in movie modes but can easily be switched of by tapping the screen icon. You can also touch focus during recording by tapping the object you want to focus on. Interestingly, despite not officially supporting continuous AF with EF lenses, I found they acted the same on the EOS M (in terms of focusing options and operation) as native EF-M lenses when filming video. Impressively the EOS M also trumps its rivals with the inclusion of an external microphone input in addition to built-in stereo microphones and the chance to manually adjust audio levels. Like Canon’s DSLRs, but unlike many of its mirror-less rivals, the EOS M does not offer 1080p at 50p or 60p, limiting its usefulness for slow motion. To be fair though this hasn’t held back Canon’s DSLRs and many film-makers will more appreciate the choice of frame rates coupled with the external microphone input as standard. Indeed it’s essentially a more portable version of what Canon’s long-offered on its DSLRs and as such the EOS M could become a popular partner for DSLR movie makers, especially in situations where you need to squeeze the camera into a small space. There’s no movie crop option as on the T3i / 600D’s, but given it was sadly unavailable on the T4i / 650D, it’s absence here is perhaps not surprising. Another surprise is that you can’t use the movie record button unless the mode dial is in the Movie position. This would be bad enough, but you can’t assign the button another function in other modes, which is a bit of a missed opportunity to say the least. This and most of the video samples here were shot using the EOS M’s 1080p25 mode. The best quality mode on the EOS M produces excellent quality results. The auto exposure handles the changing light well and the servo AF also does a good job, though it wanders a tiny bit during the zoom. The zoom action is smoother than my efforts with it might suggest, but it’s still quite difficult to get a smooth result hand-held. For this tripod mounted panning shot the stabilisation was disabled. Again, the EOS M does a great job with the exposure in fairly demanding conditions with the early section of this pan facing directly into the sun. Once again the focus wanders a little during the zoom, but recovers quickly, and there’s no audible noise from the STM AF motor. I’m quite impressed with the exposure control and the AF of the EOS M in this low light pan. Canon compacts usually over compensate when panning past the windows in this bar, closing down the exposure in a very noticeable way, but the EOS M reacts quite subtly. White balance is also steady and though you can see a little bit of noise the quality is generally pretty good. In Movie auto exposure more the EOS M automatically selects Servo AF (though you can disable it); my coffee cup example here shows how effective it is. For this test I set the focus method to Flexizone and and tapped the centre of the screen to select the focus zone. Note this isn’t the same as tracking AF – the focus area remains in the centre as I pan the camera up to the bar and then back down to the cup again. The EOS M is very quick and sure of itself going from close to distant focus, but in the other direction – coming back to the coffeee cup, on both occassions it takes a few seconds to react. Though when it finally does react it brings the cup into focus quickly and smoothly without any back and forth. You can tap the EOS M’s touch-sensitive screen an any time during recording to focus on an object in the frame. For this example I selected Movie manual exposure mode, set the sensitivity to 800 ISO and selected 1/40 at the widest avaialbe aperture of f4. starting with focus on the cup, I tapped the screen in the area of the bottles to the right of the beer pumps at the bar, then back to the cup and so on. The EOS M responds quickly, but the AF is jittery, never quite settling on the focus point but jumping around either side of it. To compare the touch focussing performance of the EOS M with the EF-EOS M adapter and EF lenses I set up this shot with the camera mounted on a tripod and shot the same scene with the EF 85mm f1.8, followed by the EF 50mm f1.4 then the EF-M 18-55mm f3.5-5.6 kit lens. I set Movie manual exposure mode and set the lens to its widest aperture, initially focussing on the door knob on the left of the frame. During the course of the clip I changed the focus several times by tapping on the umbrella down the hall then door knob again and so on. The 85mm f1.8 produces amazingly shallow depth of field wide open, and the AF is smooth and sure-footed. The noise of the AF motor (even on a USM model) is pretty intrusive, highlighting one of the advantages of the quiet STM native mount lenses, but you could deal with it by attaching an external microphone. The 50mm f1.4 provides a wider angle of view but still maintains very shallow depth of field. Like the 85mm f1.8 it’s AF motor is noisy and you’l need to plug in an external mic to avoid it ruining the audio. the touch AF performance is similar to the 85mm f1.8, appearing to go a little past the focus point before returning. For comparison here’s the same scene shot with the EF-M 18-55mm f3.5-5.6 at 55mm. a much wider angle of view and the f5.6 maximum aperture doesn’t provide anything like the shallow depth of field of the other two lenses. I’ve also had to increase the ISO sensitivity to 3200 so it’s a little noisy. With the native EF mount lens though, the focus does seem quicker and more accurate, plus the quiet STM motor means you can record audio using the built-in stero microphones. Here’s another sample video using the EF-EOS M adapter and EF 85mm f1.8. Again this shows touch focussing in action, this time in better light outdoors. One thing that’s obvious from this clip is that unstabilised longer lenses on the EOS M (the 85mm has an equivalent focal length of 136mm) are a challenge to hold steady and you’re probably going to need a tripod. In better light and with slightly more distance to the subject the EOS M seems more sure of itself here. The AF motor noise is also a little less intrusive with the ambient audio. This clip shows the EOS M’s Face and Tracking focus in action with the 85mm f1.8 wide open. The EOS M doesn’t pick up on faces unless they are quite large in the frame, so for this clip I tapped the screen to track the subject’s face and when they got close enough face tracking took over. You can hear the motor working to adjust focus as the subject approaches, but it doesn’t keep the woman’s face in focus the whole time. Canon EOS M with EF-M 22mm sample movie 12: handheld tracking AF. Movie Auto mode. In this next clip, above, you can see how well the EOS M can track focus in low light when fitted with the 22mm f2 STM kit lens. In this example I locked the AF point onto the Canon logo on the 1D X DSLR, then slowly moved the EOS M back and forth. The conditions were very dim, and with the Movie mode set to Auto, the EOS M understandably selected the maximum f2 aperture on the kit lens, although this in turn has minimised the depth of field, presenting the camera with a tougher time to keep the subject sharp. As expected, the camera had no trouble keeping the AF target over the logo as I moved it around, but the actual focusing itself was slower and generally needed a brief pause to catch-up. But given a moment, the EOS M managed to lock onto the logo and bring it into crisp focus wherever I positioned it on the frame. You’ll also notice there’s little to none of the back and forth searching of 100% contrast-based models. So while it can’t exactly be described as true continuous autofocusing, it’s not a bad attempt, and once you understand its limitations, you can work around them by deliberately filming with gentle movements. Canon EOS M with EF-M 22mm f2 sample movie 13: Manual Movie mode, f2, 1/30, 1600 ISO. In the second clip, above, I’ve locked the EOS M to a tripod, set the movie mode to Manual exposure and selected f2, 1/30 and 1600 ISO, before manually focusing on the fire hydrant. You can achieve a nice shallow depth of field with the 22mm f2 lens, especially when focusing on something close. There’s quite visible noise at 1600 ISO, but it’s at the upper limit of what’s acceptable for decent quality. I’d still sooner keep the ISO lower where possible though. Because it shares the same sensor and has many other features in common with the T4i / 650D it’s tempting to assess the EOS M’s handling in DSLR terms, but in essence it’s a consumer model and nowhere is that more evident than in the the mode dial which is the same design as on many of Canon’s compacts. In combination with the touch screen it actually works well though, and it’s a quick and simple process to change the shooting mode. The only criticism I’d make of it is Canon’s decision to include the PASM modes in with the Creative auto and scene modes, though with only three positions on the dial it’s hard to see where else they could have gone. The touch screen and menu system work well together, and the EOS M’s Quick Control screen, which can be accessed either by pressing the centre button on the control dial or the touch icon, provides easy access to almost everything you’re likely to need including image quality, white balance, picture style, metering mode and Auto Lighting Optimizer settings. The touch icons for these appear in two vertical strips overlayed on either side of the screen with options displayed along the bottom. Rather than include ISO sensitivity on the Quick Control screen, the current setting is displayed on the info overlay from here it can be tapped and changed directly. There’s also a useful magnify icon which displays the focus area magnified by 5x with a single tap and 10x with a second tap. But there are some rough edges that need smoothing. For example the Quick Control screen allows you to set the focus method and select One Shot or Servo AF operation, but to switch to manual focus, or AF plus manual – something you’re likely to want to do quickly when the circumstances warrant it – a trip to the menu system is required. Playback navigation feels very responsive. You use the touch-screen to swipe through images and pinch to zoom like a tablet or smartphone, and the EOS M feels as quick and responsive in this regard as the best of the current mobiles. I did however note that magnified images stop scrolling as soon as you remove your finger from the screen, rather than having momentum and gliding a little further. There’s comparatively little scope for customisation. The EOS M has few physical buttons, which limits the options to begin with, but Canon has missed an opportunity to use the movie record button, which is redundant when the mode dial isn’t set to the movie position as an additional physical control in the stills shooting modes. As it is, the left and bottom positions on the four-way controller can be programmed, but the former is restricted to AE/AF lock functions and the latter has a choice of only five options – re-centering the AF area, Depth of field preview, ISO sensitivity, flash exposure compensation and LCD brightness. Compared with the Olympus PEN E-PL5 which has a programmable function button, movie record, two positions on the four-way controller plus a second L-Fn button on lenses that have it. And the E-PL5 provides a wider range of assignable functions including Manual focus, custom white balance, RAW, and HDR bracketing. The E-PL5 also provides no fewer than 5 custom shooting setups, compared with none on the EOS M.
Like the EOS T4i / 650D before it, the EOS M features a hybrid AF system which employs a combination of contrast-based and phase-detect AF systems, the latter integrated into the sensor itself. As I understand it, the 31 phase-detect AF points are concentrated in an area towards the centre of the frame and are used to perform initial calculations and determine the direction the lens should focus, before leaving the contrast-based system to nail the final focus. Obviously should the subject fall outside of the phase-detect AF points towards the edges of the frame, the system becomes contrast-based only. There are four AF methods Face detection and Tracking, Flexizone multi, Flexizone single and manual focus. To initiate tracking you simply touch the screen to select the object you want to track, but touching the screen in any of the focus methods will focus on that area. Technically it all sounds promising, complementing the accuracy of contrast-based AF with the confidence of phase-detect, in practice, however, the EOS M’s AF is painfully slow. In some situations it can take more than a second to acquire focus and even in good light falls well short of other mirrorless CSCs like the Olympus PEN E-PL5 or Panasonic GX1. In fairly optimal conditions with good lighting I’d say the EOS M takes, on average at least twice as long as the PEN E-PL5 to lock focus. Where the E-PL5 beeps almost the instant you press the shutter, there’s a more than perceptible delay with the EOS M. You might expect the AF speed to improve with the brighter 22mm f2 pancake lens but in practice I found it to be no swifter than the 18-55mm f3.5-5.6 zoom. I used the EOS M in a variety of situations from a birthday party to a night-time street carnival and I never really felt in control when there were moving subjects. Too often I missed the moment due to slow AF or the image was out of focus. While it’s fine for landscape photography, if future developments of the EOS M are to appeal to enthusiast photographers this is something that Canon will need to address. AF speed simply isn’t an issue on CSCs from Olympus, Panasonic Sony and Nikon and currently the EOS M takes last place behind everyone else. The EF-EOS M adapter allows you to fit any Canon EF or EF-S lens to the EOS M. The adapter itself is quite large – it needs to be to shift EF and EF-S lenses as far from the sensor as they would be on a DSLR with a mirror in-between. The adapter is 22mm deep with a diameter of 67mm and weighs 110g. Add the EF 50mm f1.4 lens (which on its own weighs almost as much as the EOS M body) and the total weight including the EOS M body with battery and card comes to a hefty 698 grams. But it’s still a lot smaller than a DSLR and feels like a good fit in your hands. The adapter has no physical controls other than the lens release lock, it’s basically a tube with electronic connections, but it does have a removable tripod mount. so you don’t need to worry about stressing the EOS M body if you have big heavy lenses attached. The EF-EOS M adapter allows electronic control of aperture settings and full autofocus with EF and EF-S lenses. Fit an EF lens to the EOS and you have the exact same functionality as you would with an EF-M lens fitted. You can use any of the PASM or other exposure modes, select any of the three AF methods (or manual focus), and choose between one-shot and Servo AF. These modes are also available for movie shooting. Canon notes in the specifications that the EOS M does not support continuous autofocusing when fitted with EF lenses, but in practice this requires some qualification. Misleadingly Servo AF is not greyed-out when Continuous Shooting is selected, but once you start shooting, the focus is locked on the first frame – so it acts as if it were set to Single AF all along. In movies though, the EOS M actually takes a stab at continuous autofocusing with EF lenses, or at least making mutliple single AF adjustments in a row. You can see some examples of this in the movie section above. I tested the EOS M with the Canon EF 50mm f1.4 USM and EF 85mm f1.8 USM and I was impressed with its ability to function in exactly the way as if an EF-M lens was attached – this includes support for Servo AF continuous AF for movies, which I originally thought would only work with native EF-M lenses. The AF speed is however a little slower than with the native lenses, which lest we forget wasn’t quick to begin with. When you half-press the shutter the initial phase detect process may be pretty fast, but it’s the second contrast detect fine tuning bit that adds to the overall lag. But if you can live with the lack of speed and continuous AF for stills it’s great to be able to use EF lenses so seamlessly in this way. And for movie shooting, where the speed isn’t such an issue, (though the sound of noisy AF motors might well be) having access to a library of quality fast lenses is a real bonus. See my examples of touch focus using the EF 50mm f1.4, EF 85mm F1.8 and EF 80-200mm f4.5-5.6 II in the movie section above. The EOS M offers one continuous shooting speed of 4.3fps. The camera supports the extra speed of UHS-1 SD cards and fitted with one you’ll be able to fire-off a burst of 17 JPEGs or six RAW files at 100 ISO. A speed of 4.3fps is a little slower than the 5fps quoted for the EOS T4i / 650D, and much slower than the fastest of its rivals which can shoot closer to 10fps. I should also note that 4.3fps is the maximum speed you’ll get from the EOS M with autofocus and exposure locked on the first frame. Switch the camera to continuous autofocus and the burst speed falls to 1.7fps with the EF-M 18-55mm or 1.2fps with the EF-M 22mm. To test continuous shooting on the EOS M I fitted it with a freshly formatted 8GB SanDisc Extreme Pro UHS-1 SD card. With the 18-55mm zoom attached I selected One Shot AF mode,set the quality to Large fine JPEG, set the camera to Shutter Priority and set 1/500. The EOS M fired off the first 17 shots at a slightly faster than quoted speed of 4.6fps. The buffer is large enough to hold 17 JPEGs, but the camera continues shooting beyond that if you keep the shutter pressed down. It doesn’t sound like the speed slows a great deal, but it does become a little erratic. I kept the shutter depressed until the EOS M had taken 100 shots at an average frame rate of 3.7fps. However, the first 30 shots came in at 4.47fps, so you can get a reasonably lengthy burst. With a SanDisk Extreme Speed Class 10 card fitted, I timed 15, 30 and 100-frame bursts at 4.54, 4.61 and 4.13fps, so, bizarrely, the EOS M’s continuous shooting speed was slightly better with the slower card. Again with the UHS-1 card fitted, I switched to Servo AF mode and repeated the test. The 17 and 100-frame burst rates with continuous (servo) AF were 1.75 and 1.68fps respectively, pretty close to the quoted figures, but too slow to be of any practical use for action photography. I should also add that these test were done in good lighting conditions with fairly static subjects. If the light is poor, or the subject is moving around a lot, the continuous shooting rate will drop below even this slow rate. The absence of continuous AF on ‘legacy’ EF lenses is without a doubt a disappointment for anyone hoping to use the EOS M as a mini action camera, but even when fitted with native EF-M lenses, the burst speed with continuous AF is very slow. All mirror-less system cameras slow down when you enable continuous AF, but most deliver at least two to three times the speed of the EOS M.
So the Nikon 1 system remains the best choice for compact action shooters and soccer Moms, boasting 10fps with autofocus for decent burst lengths. It’d be nice to think Canon’s holding back for a sports-focused EOS M body in the future, but I suspect the traditional decision-makers at Canon would avoid that in fear of cannibalizing sales of their quicker DSLRs. Clearly they don’t mind other manufacturers cannibalizing their sales though. While the slightly smaller sensor in the G1 X fuelled some speculation that the EOS M would adopt the same, it makes sense for the EOS M to employ an APS-C sensor. It means it can use the existing range of EF and EF-S lenses with the same field-reduction factor we’ve come to understand from EOS DSLRs, while also eliminating any concerns over performance in terms of noise and tonal dynamic range. Indeed it’s a pretty easy sell: the EOS M has exactly the same image – and movie – quality as the EOS T4i / 650D. Adopting APS-C also gives the EOS M a sensor area advantage over arch rival Nikon and the Micro Four Thirds standard, although as Sony NEX owners know, a bigger sensor invariably needs a bigger lens in front of it. The Nikon 1 and Micro Four Thirds systems have the potential for smaller lenses, and as the most established mirror-less format, Micro Four Thirds also enjoys a catalogue of over 30 native lenses compared to just two at launch for the EOS M.
Of course the EOS M can also exploit EF and EF-S lenses, but as I discovered, the already sluggish AF becomes slower still. You simply can’t beat having lenses in the native format for the best performance, not to mention exploiting the absence of a mirror in the body for compact size. And finally, the sensitivity ranges from 100 to 25600 ISO, or between 100 and 6400 ISO in Auto mode. To see how the quality of the Canon EOS M measures-up in practice, take a look at my Canon EOS M quality and Canon EOS M noise results pages, browse my Canon EOS M sample images, or skip to the chase and head straight for my verdict.